U.S. stocks have been on a tear. The S&P 500 Index has climbed a surprising 20 percent so far this year, as a global synchronized recovery takes shape and funds flow back to equities. As I often say, investors take risks when they try to stop a bull run, and plenty of data suggest you might regret taking that action this year. Consider the optimistic views from Joshua Brown, i.e. The Reformed Broker, as we have “all the rocket fuel we need for an explosion.” There’s no election, no war in Syria, and no taper talk. Banks are highly capitalized, stocks around the world are cheap and hedge funds’ short positions are the highest since January, says Brown. If his post doesn’t convince you, we have even more ammunition, especially regarding cyclical and growth stocks. 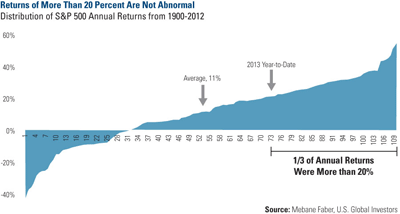 Did you know going back to 1900, the market’s annual returns have been more than 20 percent about one-third of the time? Take a look at the distribution of S&P 500 annual returns charted by Mebane Faber Research, which shows the possibility of stocks going higher. If you were able to invest in the market during the entire 112 years, you would have pocketed an average of 11 percent. But even though the 2013 market return has been more than the average, there were more than 30 years when stocks increased more. Of course, we can’t guarantee future performance, but history has seen years when stocks increased 25, 30 or even 40 percent over the entire calendar year. Last spring, our director of research, John Derrick, CFA, recognized an inflection point occurring in U.S. stocks, with cyclical areas of the market beginning to gain strength while defensive companies suddenly started lagging. Large-cap, relatively stable companies such as Procter & Gamble, AT&T and Clorox dropped sharply at that time. If you watched the market closely, you sensed a mean reversion taking place as expectations seemed too lofty for defensives and too gloomy for cyclicals. This was a vital signal to growth investors, and those who were paying attention to the quiet ignition of cyclical stocks were wise to take advantage of this change. On the chart below, you can see the abrupt switch in leadership from defensive stocks to cyclical sectors. The line plots the ratio of cyclical areas to defensive areas of the S&P 1500 Index. When the line is rising, cyclical companies (consumer discretionary, energy, financials, industrials, materials and technology) outperform; when the line is falling, defensives (consumer staples, health care, telecommunications and utilities) outperform. Over the past decade, you can see that cyclical stocks outperformed from 2002 through 2005. But since the end of 2010, the longer-term trend for cyclicals has been heading downward—until recently. 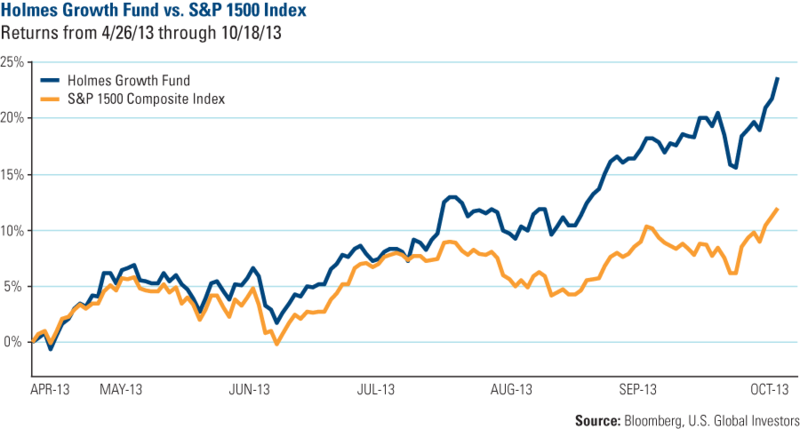 Now, after a prolonged period of underperformance, cyclicals appear poised to outperform. John continues to believe that with countries such as the U.S., Europe and China improving, cyclical and high-growth areas of the U.S. market will likely continue to take off. As investors have been reallocating out of bonds and cash into equities on expectations that interest rates may rise, chances are good that this money will find its way into cyclical areas of the market. 3. 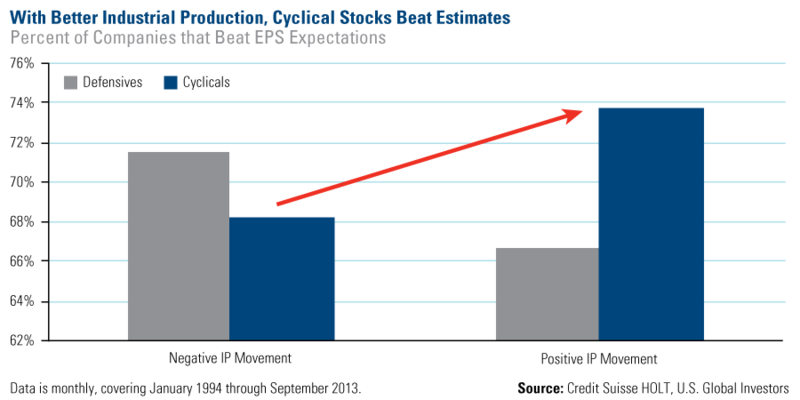 Rising industrial production is positive for cyclical stocks. As a measure of output of the industrial sector, industrial production (IP) around the world has been building momentum. In August, the IP in the U.S. and the eurozone grew more than anticipated. In September, China’s IP rose 10.2 percent, which is the second-highest growth rate this year, according to China Daily. Historically when the economy has had positive industrial production momentum, a higher percentage of cyclical companies experienced better-than-expected earnings. And companies that beat earnings typically experience a boost in stock prices. There appears to be plenty of gunpowder in the chamber for growth stocks, so if you are looking for a few ideas, consider growth strategies that have worked this year for U.S. Global. Take the Holmes Growth Fund (ACBGX), for example. From the beginning of the cyclical rally on April 26 through October 18, the fund’s return is just about double the return of its benchmark S&P 1500, as it climbed more than 23 percent. The index rose only 12 percent. The fund generally invests in companies that have better-than-average revenue growth and earnings growth while also providing a higher return-on-equity to investors. We believe these stocks have the characteristics that are the DNA of success for growth-at-a-reasonable-price investors. You can see the fund’s largest holdings here. As a side note, the All American Equity Fund rose nearly 17 percent and the MegaTrends Fund grew 12 percent, outperforming the S&P 500 Index, which returned 11.4 percent during the same timeframe. These funds invest in similar growth stocks, but take a different approach toward U.S. companies. 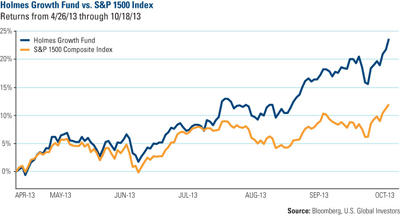 See the top holdings of the All American Equity Fund and the MegaTrends Fund. Like I said above, trying to stop a bull market has risks. With $32 billion pouring into equity funds in September and another $12.7 billion into stock funds within the last week, many investors are jumping into the market. What action are you taking?